Zones and change detection are an important part of Angular 2, and so it is important to our Ionic 2 application. I figured I understood what was happening at a surface level with change detection, but didn’t really “get it”. I decided to do a deep dive into some research to try and clarify my understanding, and this article is my attempt at summarising what I discovered by reading lots of articles by people smarter than me. This article aims to provide a simple introduction to Zones, and how they are important to change detection in Angular 2 and Ionic 2. The basic task of change detection is to take the internal state of a program and make it somehow visible to the user interface. Angular 2 runs inside of its own special zone called NgZone. Running inside a zone allows one to detect when asynchronous tasks – things that can alter the internal state of an application, and therefore its views – start and finish. Since these asynchronous tasks are the only thing that are going to cause our views to change, by detecting when they are executed Angular 2 knows that a view may need to be updated. We can go into a lot more detail than that though, and I think understanding those details to some degree helps solidify the concept. So let’s continue. I mentioned above that Angular 2 implements its own special zone called NgZone. This special zone extends the basic functionality of a zone to facilitate change detection. But what the heck is a zone anyway? The image above gives a visualisation of this. Normal (synchronous) function calls in a program are added to the “stack”, which are then executed from the top down. 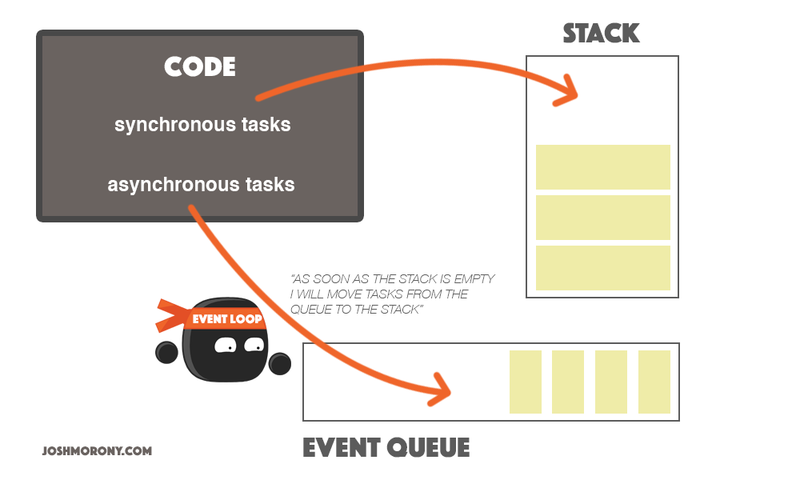 Any asynchronous function calls are added to the “event queue”. Once the stack is empty, the tasks in the queue can begin being processed. So since different threads – which execute some logic – run at effectively the same time, it creates the perfect environment for conflicts and race conditions. If a thread wanted to store some global variable, and another thread accesses the same variable, the end result of the program may depend on the times at which each thread executed – which is unpredictable and unrepeatable. Thread-local storage allows a thread to have its own global space to store variables, independent of another thread. So why are zones – these independent execution contexts – important to change detection? The important part is that the zones “persist across async tasks”, so an asynchronous task will run within the same zone that it was created. Zones don’t just allow us to run bits of code in their own happy little worlds, they also allow us to hook into them to detect when asynchronous tasks start and finish. We execute a series of functions, and we have a timer set up to detect how long it takes to execute. The issue in the code above though is that we use a setTimeout which creates an asynchronous task that will be added to the event queue. The code doesn’t wait around for the 2 seconds it takes for that task to finish, instead it will go on executing bar() and then baz() and then it will stop the timer – all before the doSomething task has had a chance to run. So the execution time that will be reported won’t really be accurate (if we want to consider the 2 seconds that it takes for doSomething to trigger). Imagine this is our Ionic 2 application – if we set up our view once the code above finishes executing, how is it supposed to know that something may have changed once doSomething actually does finish, unless we were to manually make some call from doSomething to notify our application that a change is required. We are creating a new zone by forking the parent zone and providing it with a “spec”. This spec uses the beforeTask and afterTask hooks, which can detect when an asynchronous tasks starts and finishes in a zone. We could then use those hooks to accurately time how long all of the code takes to complete, including the asynchronous doSomething function, because doSomething will trigger these hooks. Once we have our special zone created, we run the same program inside of myZone.run. This is essentially what Angular 2 does to create its custom NgZone zone and set up change detection (which we will talk more about in just a moment). So, any time that a task is executed within the context of a zone, we can detect when it starts and when it finishes. This is very powerful. How Does Change Detection Work? By now, you probably have a pretty decent idea of how change detection works. Angular 2 has its own zone – its own execution context – and it can detect when any asynchronous task starts or finishes within that zone. So any task that is executed within Angular 2’s zone will trigger a change. That’s an important concept to understand, because anything executed outside of Angular 2’s zone won’t trigger a change. We’re going to go into a little bit more depth on how this works, but still keep it pretty surface level. If you want a very low-level explanation of how change detection works in Angular 2, I would recommend reading Angular 2 Change Detection Explained. When we first run our application our code will start executing. The root component is created and bootstrapped, our components are created, all of our constructor functions in our components will execute their code and so on. Eventually, once everything settles down (the stack is empty), our application reaches a nice resting state. Everything has been determined, and our views can reflect that. A user clicking a button can happen at any time, and that button click may cause a change to a view. A HTTP request could be triggered immediately by our application, or it could be triggered by a user clicking on a button, either way it could take anywhere from 10 milliseconds to 10 seconds (to never) to complete, and it could also cause a change to a view. In this example we initially set the member variable myTitle to “Hello”. So once our application has finished loading and reaches that first “resting state”, myTitle will be “Hello” and the template will know to display it as the <ion-title>. We have a timer here though, and after 5 seconds it is going to alter the state of the application by changing myTitle to “Goodbye!“. The problem is: how is Angular supposed to know about this? Well, we already know it uses zones to figure this out, but how? As I mentioned, NgZone is a special type of zone created by Angular 2. It forks its parent zone, which allows it to set up its own functionality on that zone. This extra functionality includes adding an onTurnDone event (similar to afterTask that we discussed before), which triggers when Angular’s zone finishes processing the current turn – a turn is what happens when the event loop pushes a task from the event queue (an asynchronous task) to the stack. we can see that every time a “turn” completes in Angular’s zone it triggers the tick function. If there were some asynchronous tasks, once the stack is emptied they would be added to the stack and executed – once those have finished executing Angular would be notified that another turn has completed. This tick function then triggers change detection for each component every time a “turn” completes. Each component in Angular 2 has its own change detection, so the entire component tree doesn’t need to be updated for every change. In effect, every time an asynchronous function finishes executing, Angular triggers tick which checks for changes. This would instead run the code in Angular 2’s parent zone, the zone that Angular 2’s zone is forked from, so that it won’t trigger change detection. There’s plenty more to know about change detection in Angular 2, and if you want to dive even deeper I’ll link some resources below for you to take a look at. This article should give you a broad enough understanding to be comfortable with change detection and zones though. In reality, you’re probably not going to need to implement anything we’ve discussed here yourself, but if you are having trouble with change detection it will be handy to be able to try and figure out why it is happening.